Petaluma Two interesting meetings, one in San Jose and the other in the north bay city of Petaluma in Sonoma County brought the issues of immigrants, both documented and undocumented in California, into stark relief. I tracked down Davin Cardenas, co-director of the North Bay Organizing Project, and lead organizer for their tenant organizing for many years. We knew Davin well from the Organizers’ Forum dialogue in Bolivia several years ago and keep in touch. My first concern was to find out how the coalition they had organized was doing in their efforts to rekindle a petition drive around rent control in Santa Rosa. They had narrowly lost last year at the ballot, but in the aftermath of the disastrous fire that raged through Sonoma County, the shortage of housing and high rents was an even greater issue, so they were in the middle of another signature drive to see if they could put the issue on the ballot again. We’ll dive deeper into that discussion another time, but one of the interesting things Davin shared, especially given ACORN’s experience in the aftermath of Katrina, was their own efforts to organize support for undocumented workers and their families in the area after the fires. They organized something they called UndocuFund. The idea was simple. There are some 3000 undocumented workers in Santa Rosa and more in the county. Many of them lost work and housing in the fires, which displaced both rich and poor indiscriminately. The difference is that FEMA does not support undocumented immigrants, so the UndocuFund was designed to provide similar emergency cash support to fill the gap for these families. Davin said they hoped to raise a half-million, but they hit a cord and raised over $6 million, gaining a lot of attention. In the six months or so since the fire they have already given out more than two-thirds of the money and are getting ready to make an additional appeal since some of the same issues persist. 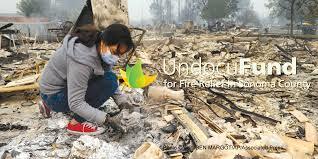 Fires in the Santa Barbara area also triggered establishment of an UndocuFund in that area. This is a real unique organizing breakthrough! Less encouraging was a meeting I had earlier in the day with an immigration lawyer based in San Jose who specializes in dealing with issues relating to immigrants from the Philippines. In his case load the issues were less about documents and more about other issues where predatory practices target immigrants. His other concern was for families caught in the crossfire of the government in the Philippines and its extra-judicial killings that are little more than masked vigilante activity triggered by concerns over drugs. At one level my friend was shocked at the amount of support some of these actions had among the Filipino community. At another level the organizing problem became how to offer support to people and institutions willing to stand up for justice and the rule of law. The issues are daunting and effective strategies are illusive, but as Davin’s experience indicated, where organizers and organizations are close to the ground, feeling the pain, and moving with their base, they are coming up with creative approaches and responses. This entry was posted in ACORN, Community Organizing, immigration reform, Organizing and tagged Davin Cardenas, Immigration, Philippines, Sonoma County, UndocuFund by Wade. Bookmark the permalink.